Nachos make me weak in the knees. The thought of melty cheese, zesty salsa, and creamy guacamole — frankly, it doesn’t get much better than that. 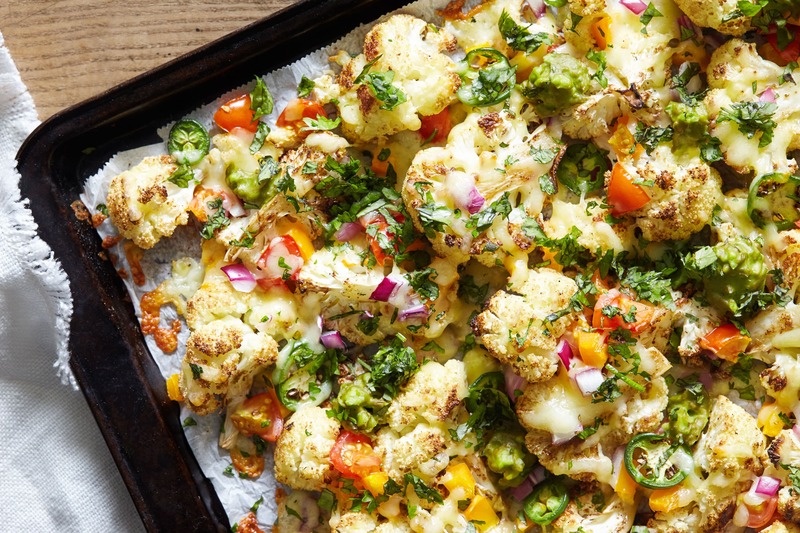 This Cheesy Cauliflower Nachos recipe is a great way to indulge in your nacho cravings, without heaps of unnecessary salt and fat. For me, it started with buffalo cauliflower, then came cauliflower rice and cauliflower bread, and now I’ve moved onto cauliflower nachos. Is there anything this cruciferous vegetable can’t do? This recipe starts by roasting cauliflower in the oven, to get them golden brown. I recommend spreading out the cauliflower florets as much as possible, so they can toast up nicely. The cumin, sea salt, chili powder, and garlic powder give an extra boost to an already delicious dish. And don’t forget the oil. It is the key to getting your vegetables to roast evenly in the oven — and it really helps bring out their flavor. When it comes to adding healthy toppings, you can feel free to get as creative as you want. The recipe here is a tried-and-true combination that I love: melted Monterey jack cheese, crisp and colorful veggies, and plenty of creamy avocado. You could also add shredded chicken, pinto beans, sliced black olives, or fresh salsa. Miss the flavor and crunch of tortilla chips? Crumble a few of these baked tortilla chips on top just before serving. 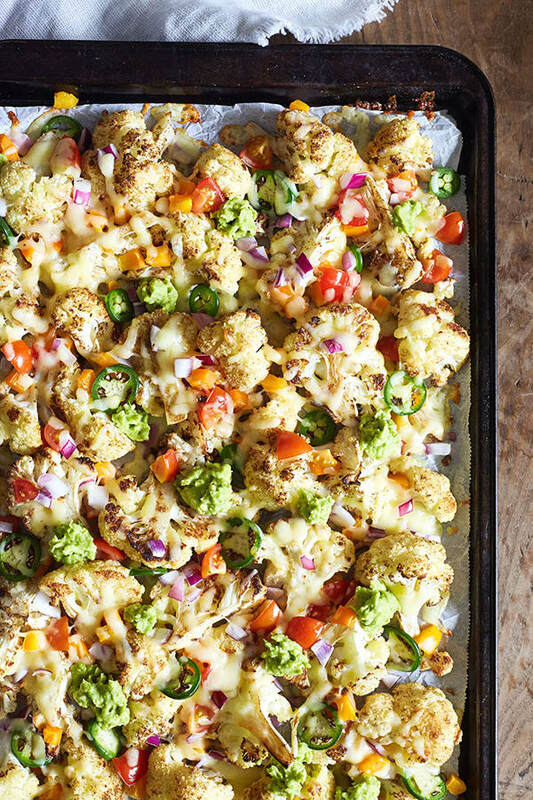 These cheesy cauliflower nachos are a fun one to pull out when you’re entertaining. My friends absolutely devoured them — and everyone loved that they didn’t give themselves a regrettable “food coma” afterward. If serving this when entertaining, I recommend roasting the cauliflower in advance. Then, all you need to do is sprinkle on the cheese and vegetable toppings. A quick trip to the oven will melt the cheese, then you’re ready to spread out the avocado and serve. Be prepared for this dish to disappear within minutes! 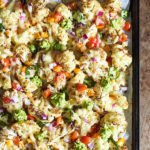 These Cheesy Cauliflower Nachos are a great way to get your nacho fix without derailing your healthy eating! Place cauliflower on baking sheet. Drizzle with oil. Sprinkle with cumin, salt, chili powder, and garlic powder; toss gently to blend. Spread evenly on baking sheet. Bake for 30 to 35 minutes, or until tender-crisp and golden. Top evenly with cheese. Bake for 3 to 5 minutes, or until cheese is melted. Top evenly with tomato, onion, bell pepper, jalapeños, avocado, and cilantro; serve immediately. Makes a great veggie side as part of lunch or dinner. Also makes a great snack(tional).